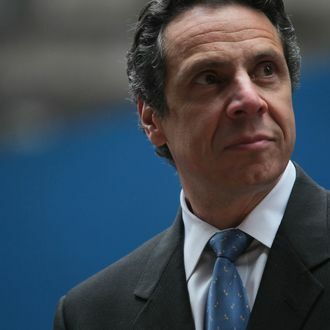 Andrew Cuomo did not emerge politically unscathed from pushing through last month’s gun control legislation, but a new Siena poll on Monday suggested it didn’t do nearly as much damage to his approval rating as a Quinnipiac poll reported last week. The Quinnipiac poll showed the governor’s popularity falling fifteen points to 59 percent from 74 percent, but the Siena poll found that it fell just four points, to 67 percent from 71 percent. How to explain the discrepancy? It’s all in who you ask, and how you ask it. “Differences in the wording and the order of questions can affect the outcome of a poll,” The New York Times explains, and Quinnipiac polled more voters upstate than did Siena. The result, a Siena pollster explained, was that Cuomo’s “numbers did not move substantially at all with Democrats or independents. His numbers barely moved in New York City and the downstate suburbs.” That leaves Cuomo in pretty good shape politically, despite a vocal minority suing to overturn the new laws.